It’s rare to hear the words woman and beer aficionado in the same sentence. That wouldn’t describe me. 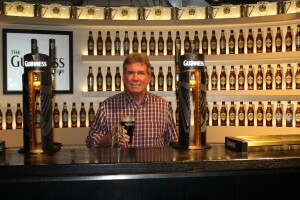 But when I passed the beer pouring class at Guinness, I did graduate to the status of beer snob. I’ve never been a beer drinker. Well maybe one glass at a baseball game if I’m sweltering in the burning sun, but that rarely happens in Seattle. 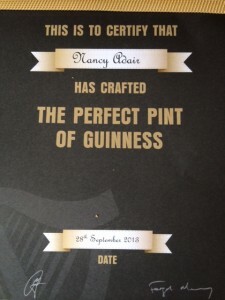 While traveling the Irish countryside, I wanted to get into the culture, so I weaned myself onto stout, starting with sips and then half-pints. I told myself it tasted like bread and repeated the mantra: less calories than Bud. 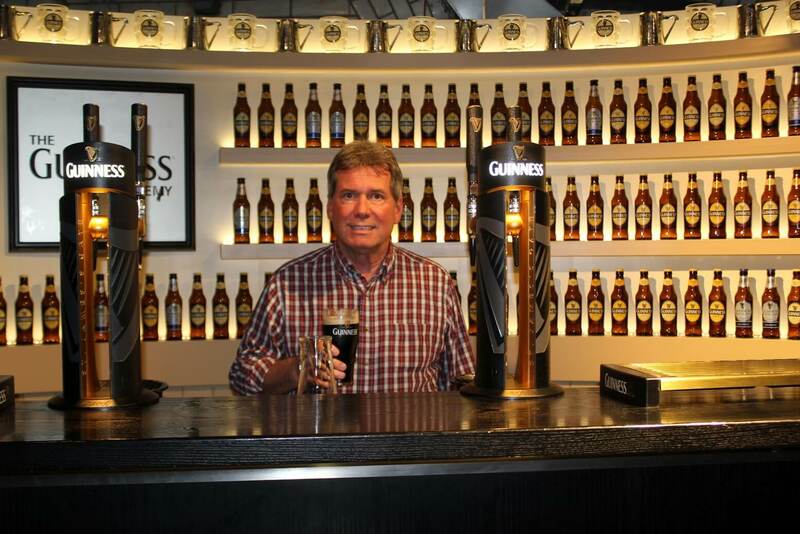 Eventually I developed enough appreciation to muster excitement for the Guinness Brewery tour. 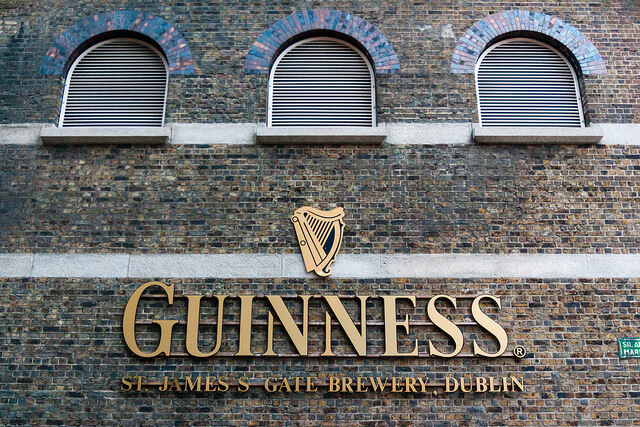 An easy walk from the center of Dublin, the Guinness Storehouse is the Epcot Center of Beer. 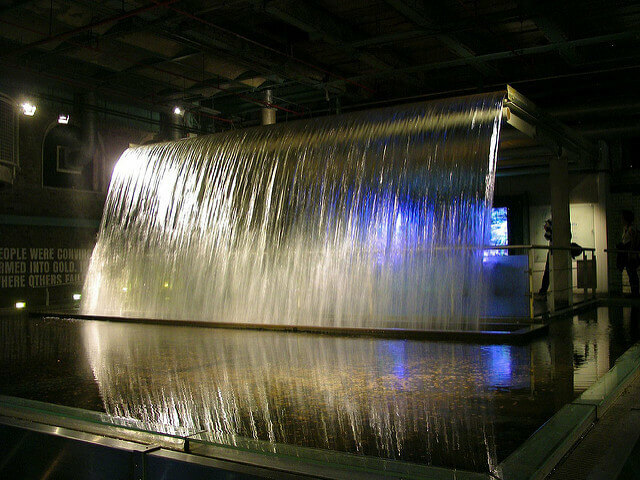 In the building that used to be the fermenting plant, you learn history and science, get some hands-on practice, ride criss-crossing escalators, and work your way up to the Gravity Bar. The free tour starts on the ground floor at the bottom of a seven-story replica of a Guinness glass. You could skip this part. The information is silly. The guide is, I think, trying to appease those Americans who always ask: How big is it? How much does it weigh? I can’t even remember the answers. The real inspiration is on the first floor, where you read about the magnanimous Guinness family. 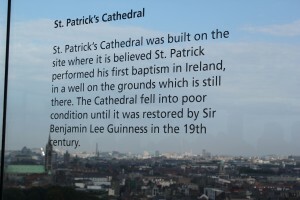 Starting business in 1759 near a fresh mountain stream, Guinness provided a beverage free of the diseases contracted from drinking Dublin’s contaminated river water. The company developed an employee benefits program way ahead of its time and provided humane labor conditions, rare during the Industrial Revolution. 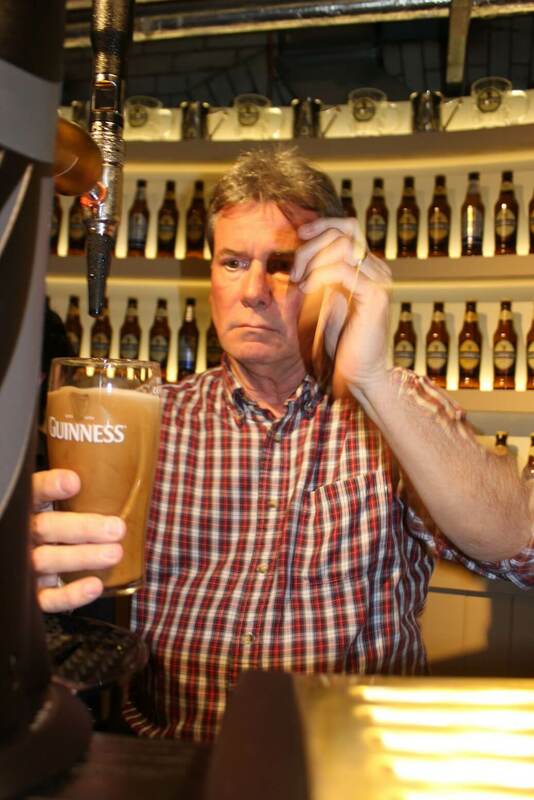 Here you learn what has made Guinness so distinctive for over 250 years. Lots of people, well mostly young guys itching for a drink, skip this exhibit. I found it interesting. We lingered awhile in front of a beautiful waterfall and then moved on to the display of old vats and hops. From childhood I remember the Schlitz commercial ending with, “just a kiss of the hops,” which I thought was about bunnies. Wrong. Now I know that hops vine themselves up a pole and then across a wire, farmed in what looks like a field of clotheslines. The hops plant produces a sweet little white flower. On the second floor you practice using the proper elbow angle for taste testing. Though your teacher acts serious, the exercise is a little silly. 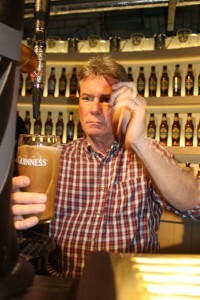 Like Guy Fiero has his stance for burger tasting, so Guinness has a stance for beer tasting. But since the beer was good and free, we played along. On the fourth floor you actually practice drawing a perfect pint from the tap. Be forewarned: in a class of eight students, it can be embarrassing for those who gas it up and have to start over. Listen closely. You must perfect the 45 degree angle and use the right number of seconds. Look at the concentration on the face of this determined student. Your final pour must have the signature Guinness red. You can see the evidence above in our two glasses, which must sit (see the one in back) until the color is just right. Success earns you a lot of pride and a certificate. After class the proud graduates can carry their glasses up the escalators to a floor of restaurants or do what we did and go straight to the seventh floor Gravity Bar. 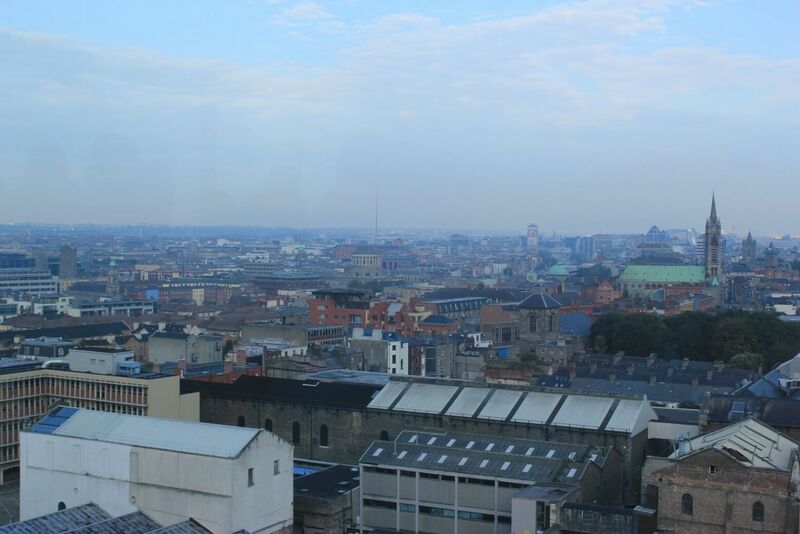 On top, floor-to-ceiling glass provides a 360-degree view of Dublin. It’s breath-taking. Even more so when you are there and not just looking at a photo taken through tinted windows. 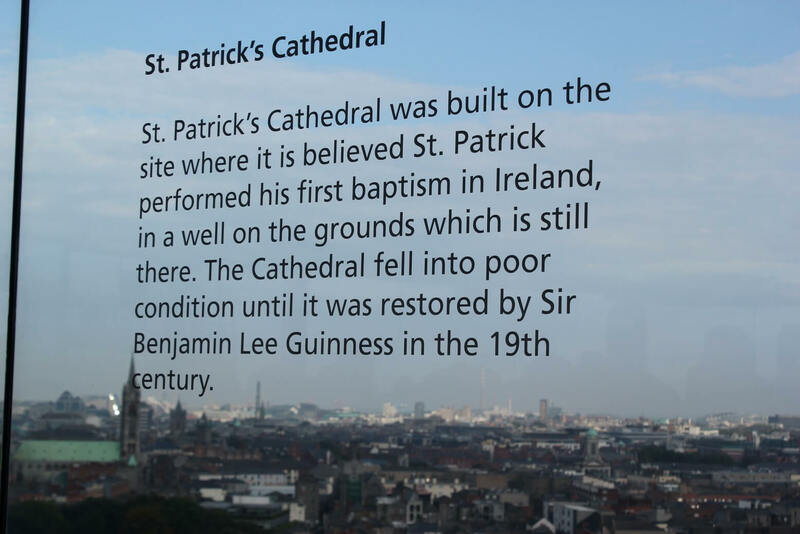 Unobtrusive transparent lettering describe the sites from various vantage points. 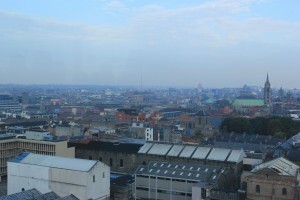 I’ve since heard Guinness has the best view in Dublin. While in Dublin, we only had time for one beverage tour. Our Air bnb host recommended the Jameson tour because it’s cheaper than Guinness. 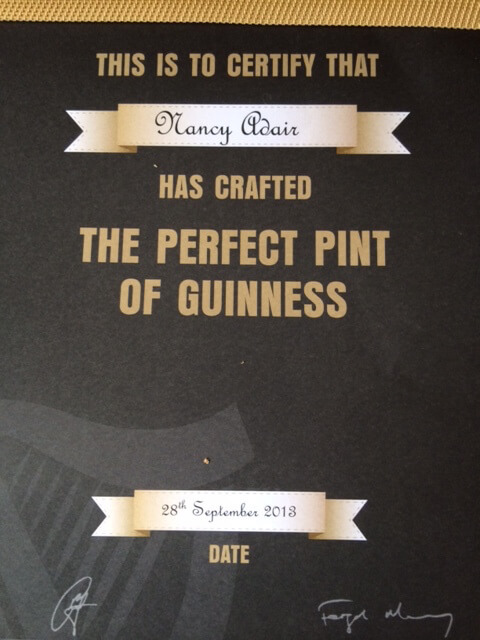 I’m glad we chose Guinness. Turns out, at Jameson, only a few hand-picked group members get to taste test while the rest of the group sulks about not being chosen. Who wants to pay to watch other people enjoy expensive Irish whiskey? 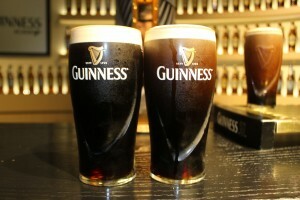 For a few Euros more, Guinness offers everyone two different tasting experiences. Plus, Guinness has the one-and-only Gravity Bar, where we lounged for over an hour, relaxing after our pouring exam, enjoying the view—and splitting a second stout. I guess I’m fully weaned. Slàinte mhath. Happy St. Patrick’s Day! Always remember when drinking a stout, chew before you swallow.